The Rolling Stones are sharing the spirit of Halloween. 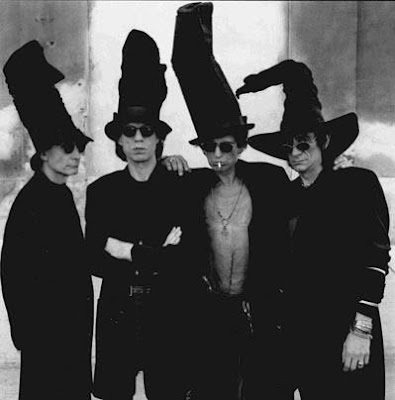 The band has posted a photo of themselves dressed fully in black and wearing huge witch hats. The Stones have played two secret shows in Paris in the past week as they continue rehearsing for their initial 50th Anniversary concerts. The Rolling Stones live shows will also mark the launch of a new venture in global touring – Virgin Live. Virgin Live sees the coming together of the Dainty Group and Virgin Group. Richard Branson and Paul Dainty’s history with the Stones spans five decades – so it is fitting that these shows marks the two joining forces for the first time as Virgin Live. The concerts follow the November 12 release of “GRRR!”, a new greatest hits collection to mark the band’s 50th. Learn more about “GRRR!” here.